Commissioned by Bonaparte in 1800 for the Salon de Compagnie at Malmaison, this painting is a homage to the key generals who died at the beginning of the Revolutionary wars: Desaix, Marceau, Dampierre, Kléber, Caffarelli du Falga, La Tour d'Auvergne, Joubert, Championnet, Dugommier and Hoche, all welcomed into paradise by Ossian. Above these heroes, a Victory and a 'coq gaulois' put to flight an Austrian eagle. 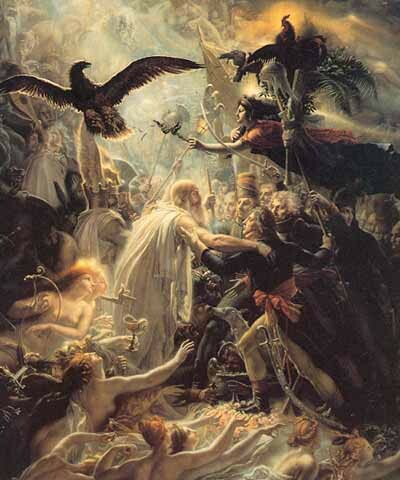 Here the ultra-republican Girodet celebrates the generals uses an allegory based on the works of Ossian – the pseudo-celtic poems invented by James Macpherson and exceptionally popular in continental Europe after being translated into French, Italian and German after 1773 – in order to celebrate these French heroes. In art history terms, this painting is fundamental in that is one of the first to make a clean break with Neo-Classicism. It is THE precursor of grand Romanticism.